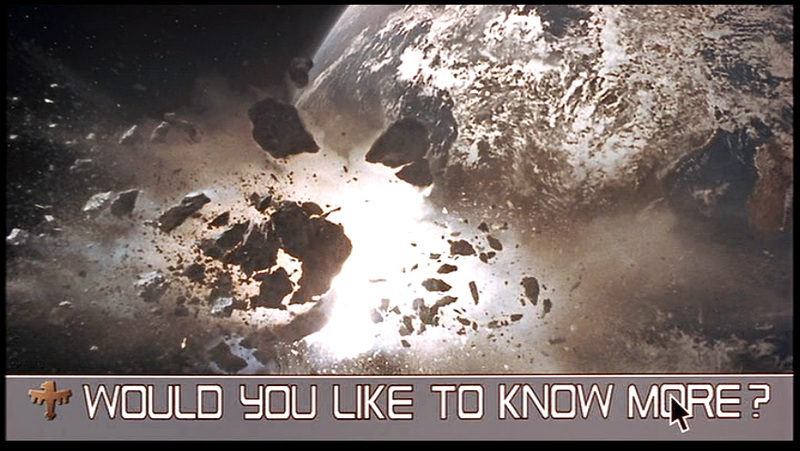 One of the most unusual conceits of the movie is “Would you like to know more?” These consist of short video news sequences with overlaid graphics and narration. At the top of the screen the user can click one of three categories for different categories of video feed, and two functions. At the end of each video sequence the “user” is prompted to interact—should they want to learn more—by clicking the legend at the bottom of the screen. The user here is ambiguous. It might be that the audience member is the user, but of course it’s not interactive. There’s probably room here for some other writer to investigate the narrative tactic/semiotics of using an interactive interface in a passive story. 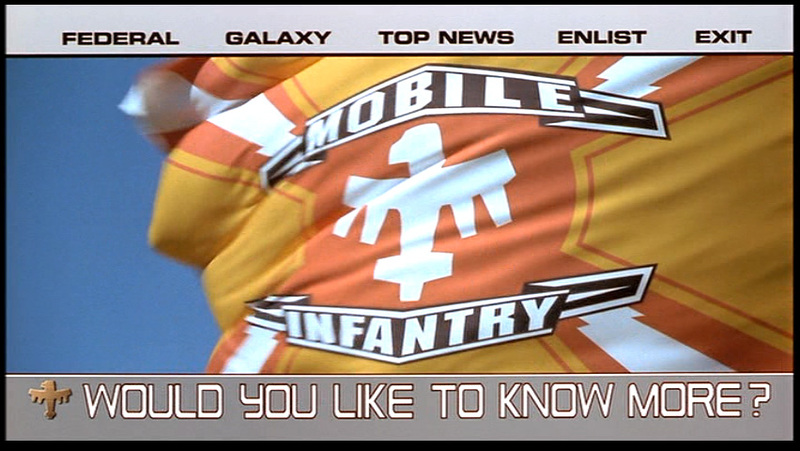 At the top of the screen are menu headers labeled “FEDERAL,” “GALAXY,” “TOP NEWS," "ENLIST," and "EXIT." For the usability purist, the collection is problematic for a number of reasons. The information categories aren’t parallel, and there’s no clear reason why they shouldn’t be. What’s the relationship between Galaxy and Federal? The functions (enlist and exit) are not visually distinguished from content categories. The current state of the interface is a mystery. Am I currently watching Top News or something else? Why does the interface chrome persist? Aren’t they distractions from the content? Maybe they should appear just only for the few seconds it’s inviting the user to interact, and fade at other times. While a fascist government would be happy to try and trick its users into clicking enlist, I can’t imagine what benefit they get from having them accidentally clicking exit to close the propaganda engine. These should not just be visually distinguished, but given different visual weight. They’d probably want enlist large and exit smaller, if there at all. The presence of the "EXIT" control implies that this is an application running in an operating system or media computer space. This opt-in news application with its small windows of time for interaction helps to paint a picture of a highly engaged and ready-to-respond audience, fitting for the mid-war society portrayed in the movie. Only once do we see an unidentified and unseen "user" control a cursor to view more. In this sequence, he or she clicks on “more” after watching a clip on the bug homeworld Klendathu. (It’s worth noting/condemning that the clickable word “more” looks identical to the rest of the non-clickable text, offering no special affordance.) In response to the selection, the application shows a live video news feed from the conflict on Klendathu. Was it just good fortune that a live feed happened to be available at this moment? More likely the application and media coordination system are smart enough to know a live feed was coming up, and played the trailer in advance as an advertisement for the content, implying a well-coordinated propaganda/content management system. 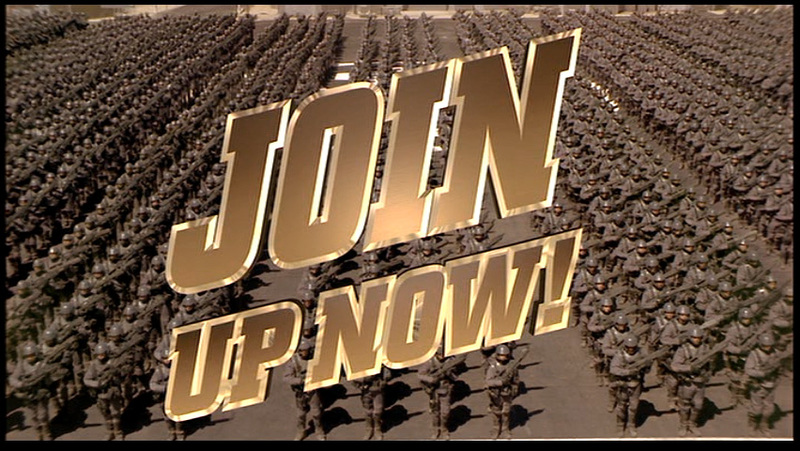 This entry was posted in Starship Troopers (1997) and tagged application, contentmanagementsystem, menu, news, optin, rollover, smallwindowforinteraction, video, wimp. Bookmark the permalink.